Ever since September of 2013, I’ve been sharing every detail of our family’s finances with the world. Each month I detail all of our spending, share how much we pay in debt, and divulge our income. It has been a great way to hold ourselves accountable and motivate us to continue on this journey to pay off our debt! When I started making our personal finances public, our income was a fraction of what it is now. I actually feel a little weird putting our income numbers out there this month, lest someone make their way here for the first time and be put off. We have come a long way on this journey. There’s no denying that we’ve truly been blessed every step of the way. Though we have worked really hard (Mr. SixFiguresUnder puts in 60-70 hours most weeks between his two jobs, not counting the commute) and have made sacrifices, we are quick to realize that we haven’t done this on our own. In case you couldn’t tell by that introduction, June was a good month. A really good month. Here are all the details! In June we paid off $9,458 in debt! Crazy, I know! The money for this debt payment came from last month’s income. It represents 67% of that income. As you probably already noticed in the graphic above, it puts us under $10,000 of debt remaining. Please don’t be discouraged if your debt repayment doesn’t look like this. We are in the homestretch of our repayment now, so we have minimized our expenses and increased our income and some months we look like a well-oiled debt repayment machine. It wasn’t always this way though. We were going slow and steady for a long time before we built up this kind of momentum. If you want to see what I mean, you can check out some of our old repayment reports. Our total net income for June was $18,147. I know that is ridiculous. Seriously. Since we live on last month’s income, this is income that we haven’t used yet. We will be budgeting and spending it in July. Attorney Income (Day Job)– $5,141 Mr. SixFiguresUnder has been working full-time as an attorney for the state of California since last fall. His actual take-home pay is $3,778, but I add back in the cost of the benefits (insurance, dental, vision, parking, union dues and retirement) that are automatically taken out of his check so that I can show them to you in our budget below. Attorney Income (Private Practice)– $10,519 On top of working full-time (with a three-hour round-trip commute), my husband has his own private law practice on the side. The days are long and won’t be sustainable for the long haul, but right now the extra income is really helping us tackle our debt. This month’s private practice income was much higher than normal because (1) he was finally paid for some overdue bills (some were from last fall!) and (2) he finished up a matter that he had been working on for over a year, but which he doesn’t get paid for until the very end. My Income (Blog)– $2,487 The income that I report is the income that I received this month minus all of my blogging expenses. Tithing– $1,400 We happily pay a 10% tithe on our total income from the previous month. You can read more about why we pay tithing even though we’re in debt. Health Insurance– $708 We have our insurance through my husband’s employer. This is the portion of the insurance premium that his employer does not cover. It includes dental and vision insurance premiums too. The portion that comes out of his paycheck will go down after he has worked at the state for a year. Car Insurance– $105 We insure two older vehicles (both 1997). Our auto insurance is great. In addition to the wonderful coverage, they also give us dividends at the end of the year, which is always a nice treat. Food– $298 We stayed under our $300, but just barely. We don’t have a separate category for eating our because it’s such a rarity, so if we ever eat out it comes from our food or entertainment budget (if it exists that month). We got In-n-Out once and pizza twice this month. We were in town every day for two weeks for swimming lessons and several times we stuck around town because of something happening in the evening. I usually pack a lunch to take with us on long days in town, but when we were in town for two meals, I made sure we could fit pizza or burgers into the budget. Gas– $423 Remember how I said we went into town every day for two weeks? Well, looking at the gas budget, there’s no denying that’s true! That’s the hidden cost of swimming lessons right there. Next month should just be the normal commuting gas expense (around $300 or so). Clothing– $115 It has been ages since my husband had dry cleaned his suits, so he finally got that done. Working for the state, he wears a shirt and tie every day, but not a suit, so we don’t have to dry clean as often as when he wore a full suit every single day. Also, I ordered a new swimsuit for the baby and for me. Most of it was paid for with a gift card (from credit card points). Household– $21 Toothpaste and tomato plants. In the past we’ve started our tomatoes from seed, but that definitely didn’t happen this year! We also got a few random small things from the thrift store. Baby– $8 This category only pops up only occasionally, since our fourth little one hasn’t cost us much at all. I bought a pack of disposable diapers. We use cloth diapers most of the time, but I use disposable at night sometimes. Entertainment– $1 We watched a movie on VidAngel. If you haven’t tried streaming with VidAngel, I definitely recommend it. It’s super convenient because you don’t have to leave home, plus they have newer movies than other video streaming companies. You can also choose to filter out any content you don’t want. Medical– $60 Dental work for hubby (and more to come next month!). Gifts– $43 This includes a wedding gift and a father’s day gift plus postage. Kids’ Summer Activities– $242 The majority of this is for swimming lessons. That was one of the three activities we planned to pay for this summer. The kids paid for the county fair tickets and rides with money they earned by recycling cans and bottles that we collected on family walks and hikes. My husband and I had to pay for our tickets though, so I included those here. Quarterly Estimated Taxes– $500 We paid our second quarter estimated taxes based on the safe harbor amount. This is for both my husband’s and my self-employment earnings, so for simplicity’s sake we just take it out of the family budget right now. We will definitely have a tax bill in April because we’re making much more than last year (since he didn’t open his own firm until the fall). The safe harbor payments satisfy the requirement though, so it works for us! And there you have it! All the details of our personal finances in June. I know some of you who have been following for a while like to guess what the next month will look like based on the income we report in these updates. I think that’s kind of fun! Considering the income reported above and the amount of debt remaining, next month’s payoff shouldn’t be too hard to guess. In fact, with our method of making two debt payments each month (one at the beginning and one at the end), you can expect an exciting announcement really soon. 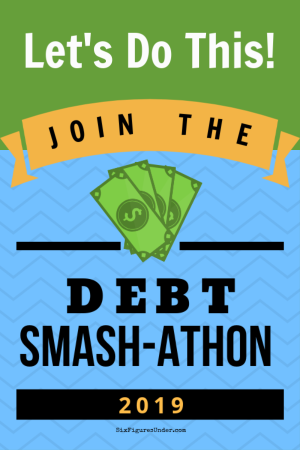 I’d love to hear about how your budget and/or debt repayment went in June! Thanks for always being so encouraging Liz! Thanks for cheering us on! Congratulations! You started this repayment engine going and kept revving it up! I can’t wait to hear about the house down payment savings plan next! Wowza… I’m so excited for you! I wish I had an extra $10k… I would send it to you so you could make that final payment and leap for joy! Can’t wait to see your August post! Also, if you would have started your journey off with making the kind of money you do now, you wouldn’t have had anything to blog about…. lol! Ha ha Moncia! That would be cheating anyway! 🙂 And yes, very true about not having anything to blog about if the repayment was easy. When I finally get to do a payoff post, I’m going to make some graphs to show how our income has increased and how the payments were slow and steady for a long time and then really took off in the end. Wow! Methinks it will be all gone before this summer ends. I know! Crazy, huh!? It’s still surreal to me right now. Stephanie, I’ve never commented before, but I’ve been following every single post of your blog since the very beginning. I am so grateful that I found your blog– you have been so inspirational to me! I am so happy for you and your family for how much you have been able to accomplish. It’s incredible! You should not be embarrassed in the slightest for your income, you have worked so hard! Congratulations on being in this home stretch!! Thank you for your sweet comment Heather! Thanks for sticking with me through all of this. Wishing you the best on your journey as well! WOW! I’ve been reading your blog since the beginning and I’m awe inspired by this. You and your family have worked so hard to get here. What a wonderful summer blessing for you to be NEARLY there. AND so far ahead of schedule . I know its early but CONGRATULATIONS!! You are so close to entering the debt free club. YIPEPPEEPEPPPEE! Thanks Paivi! When we set our goal, it was a stretch goal for sure. We never thought we would be done early! Thanks for reading and for being happy for us! OMG! A few things…..you owe less than $10,000!!!! You must feel amazing! Second, I need to be somewhere in 25 minutes but I’m still in bed. I was like, “well wait, let me see if Stephanie posted….” And third, I’m finally living off last month’s income! I didn’t want to take a month off debt repayments to do it, so now that my student loans are paid off, I did it! Also, I was talking to a friend last night and I told him I would pay for ynab for a year for him, that’s how confident I am with it! I can’t ever imagine my life without it! Congrats on another amazing month! Ha ha! I love that you thought about checking my blog before you even got out of bed. If that isn’t flattering, I don’t know what is! And how thoughtful of you to give the gift of YNAB to your friend. It has made such a difference for us. I’m glad you love it too! OHHH MY GOSH! I couldn’t wait for today to see your numbers!! I know that sounds nuts because I don’t know you and it’s not my money nor my concern – but WOW. How exciting!! YES Judi! I’m so excited about that too!! I’m impressed that you remembered about the bikes! We already got rid of all of the kids’ “sixth-hand bikes” (as my husband calls them)! Thanks Mandy! We are bursting with excitement (but it’s surreal at the same time)! How exciting for you all! In June we paid all of our bills a month in advance, bought some things in bulk and paid 4 times our normal student loan payments. I’ve been making more of our food from scratch again so we’ll be able to redirect some of the food budget to student loans. That’s great Amy! Four times the normal payment is huge! And paying your bills in advance will be so nice! Way to go!! So, so happy for you. I also have been reading your blog for a long time and been inspired by you. In the past two months I increased my mortgage extra payment from $400 a month to $500 a month AND increased my 401K contribution from 5% to 7%. My salary has stayed the same for the past two years and my son turned 18 last year and child support ended. In other words, I’m doing more with my money (saving & paying down debt) with less income. I’m so grateful to have found your blog through the former Thrifty Thursday linkups. Congrats and have fun making the last payment – whether it is kissing the envelope good bye or pressing “enter” together with your husband. What a long haul! That is awesome Libby! You are doing way with less income! Way to go! 🙂 Thanks for always being so encouraging! What a huge achievement. The end is in sight but the values you’ve taught your children will go on. We see such huge amounts of misery caused by debt in the UK, uncontrolled, head in the sand type of debt. Soooo close – I am really excited for you. OH MY GOODNESS – this is SO EXCITING! I am a long time readers and I am over the moon happy for you! You have worked really hard to reach this point and deserve the celebration of NO DEBT that you are about to have! WAY TO GOOOOOOO! Thanks for being so excited for us Julie! It means so much! This is really phenomenal, congratulations! I’m most impressed with your commitment to tithe, and envious that you can contribute so much! My goal is to get to $1,000 a month but it’ll take some time – I’ll be chipping away at it like you’ve chipped away at your debt, having faith! You’re such an inspiration! Thanks Shira. You’re right, it definitely takes faith! One more month maybe…the waiting to make the next payment is the hardest part!!! We could hardly sleep the night before and we were at our credit union before they opened Monday morning to make our final payment. It is the best thing in the world – not owing anybody anything! Go Team SixFiguresUnder! You are so very close to closing this get out of debt chapter and beginning a new adventure! Can’t wait to read what’s next! So happy and excited for you and your family! I can’t imagine how excited you guys must be right now. I know it’s not easy having your husband work extra hours and work so far away, especially with 4 kids, but look how it’s paid off! Yes! We’re excited Jenni! 🙂 It’s is definitely paying off! Congratulations on all your hard work. You are an inspiration to others. Thank you so very much on sharing your journey with the rest of us. Thanks for the kind words Linda! Congratulations!! I only found your blog a few months ago, but I’ve been hooked! While we are blessed to have been debt-free for more than a decade, I have realized how much money I’ve been frittering away – and your blog has inspired me to tighten things up. Thank you! Thanks! That’s great that you’ve tightened things up. 🙂 And awesome that you’ve been debt-free so long! Congratulations! I can’t imagine how tough it is on your husband to be working such long hours and be apart from you and the kids; and I can’t imagine how tough it is on you and the kids to spend so little time with him. I sure hope he’s able to cut back on hours soon! But WOW!!!! Him working two jobs has certainly made a huge dent in your debt repayment! And of course your blog and continued frugality and corner-cutting left, right, and centre has certainly made a huge dent too. Congratulations to all of you! Thanks Becca! We are definitely looking forward to when my husband cuts back to one job in the future. He is a wonderful dad and the kids love him to pieces. One of the ways this has been do-able for us is that Saturday and Sunday are sacred. That’s our time together as a family. Every once in a while he will have to do a work thing for a couple of hours on a Saturday, but absolutely never on a Sunday. Also, every Monday night he comes home for “family night” where we have a structured family time with a lesson, a game, songs, prayers, treats, talent, etc. We rotate who is in charge of each aspect. It’s a fun time that we all look forward to every Monday night. I’m Mormon too. 🙂 (My husband isn’t; he isn’t comfortable with the gender roles or social politics of the church; but we still do FHE.) I was actually hoping your husband isn’t in the Bishopric or something like that, because 60-80 hours of work plus a demanding calling would mean you’d never get to see him! So excited for you! Congratulations for getting that awful burden off your back. Your hubby has been pulling in some serious dough, which seems to have really accelerated your payment goal. And your meaningful blogging money is also awesome. God bless. Thanks for the kind words Tim. My husband has had some really good months lately which has definitely made a huge surge in our payoff efforts! So exciting for you guys!! Next month could be the last debt pay-off report! As a long time reader, I know how hard you have worked over the years to finally make these awesome strides in repayment, but could see how it might seem unattainable for new readers. I think the slow and steady approach generally does result in remarkable gains after you have developed the habits to consistently refine your approach. I have found this to be true in fitness as well. Only after I worked on my form in running and cycling for several months, did I begin to gain speed. And from the outside, it might looks like I suddenly got faster. But in reality, it was just all those little gains plus the experience that finally paid off in a massive way. Wow!!! Congrats!!! Debt freedom within the next month! Sooo soo thrilled for you and your family!!! A few more months of this kind of income and you will have your house in no time! YAY!